← Far Cry 4 – Shots of the figurine ! 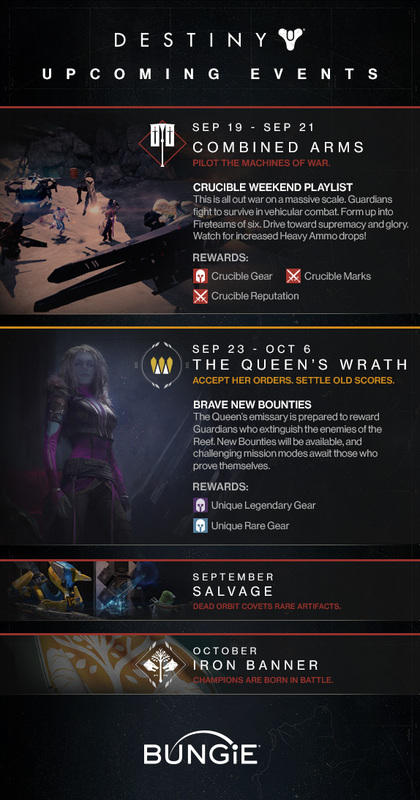 Destiny – Events Starting 09/19 ! There should always be something new to experience every time you play Destiny. To give you new reasons to bring the fight to our enemies – and to each other – we’ve loaded our cannons with some more special events. Some of them will recur regularly. Others will happen when you least expect them. There are many ways to forge your legend. Return to the wild. Return to the Crucible. Defeat your enemies and reap the rewards. We’ll be here to watch your career with great interest, and keep your head in the game.